Note: Tested on Acekard2i AKAIO.1.7 iDeas 1.0.3.6, desmume-0.9.6 and found working. 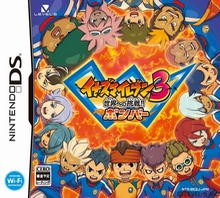 Note: Copy any of the above Inazuma Eleven 3 - Sekai he no Chosen!! Bomber (Japan) rom download links and paste it into your browser to download. Thanks for the link, Soon as i have the game and test it i'll start uploading it at other places. I already tried that and it crashes again. Then a message saying I need BioNds7.rom and BioNds9.rom files. How can I can get it to work? I downloaded those files and worked. I hope it doesn't get freeze anywhere. I love you man thx!!!! Game stops after the K team match (mix with İtaly team). can i play this game using edge v1.11? and with using the patch? after i use's the patch it become's .bak file please help what's the meaning of that?